General Hospital (GH) spoilers reveal that Detective Chase (Josh Swickard) is planning a shocking arrest. Curtis (Donnell Turner) found Betsy (Deborah Strang) at Jim Harvey’s (Greg Evigan) place in Buffalo, so now Jordan’s (Vinessa Antoine) got some solid ammunition. She told Chase to arrest Jim for unlawful imprisonment as a start. Jordan can build the rest of her case and bring more charges soon. Of course, Jim’s still out there for now and that could spell serious trouble. 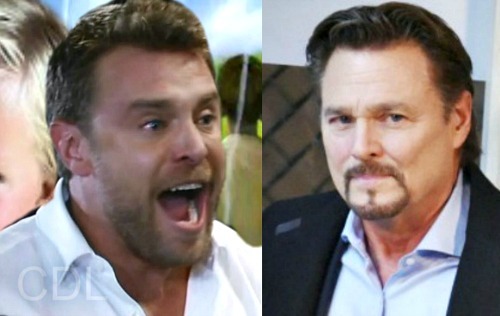 General Hospital spoilers say Betsy will be on a mission to tell Drew (Billy Miller) and Franco (Roger Howarth) the truth. She was a mess during her recent chat with Jordan and Curtis. Betsy’s a little off her rocker, but she never wanted to hurt the boys. That’s why she’s determined to make things right. GH fans can expect Betsy to seek out Franco and Drew, but will Jim get to her first? That seems like a good possibility since Jim hasn’t been taken into custody yet. Jim might run into Betsy and make a last-ditch effort to silence her. Since holding Betsy hostage didn’t work, Jim might have a deadlier scheme in mind. Meanwhile, Drew and Franco could sense that something’s up. Jordan fill them in on what happened and leave them with concerns for Betsy’s safety. They could learn that Betsy was quite rattled and kept rambling about trying to protect the boys. Franco and Drew wouldn’t want Betsy to become a victim of Jim’s lethal plot. Betsy’s told a few fibs, but that’s just because she’s been scared. Jim’s the only villain in all this. Plus, Betsy is Drew and Franco’s last shot at getting the whole story. They desperately need to keep her alive! It sounds like this could serve as another opportunity for the guys to team up. Franco and Drew’s bond could grow even stronger thanks to this rescue attempt. However, Drew could ultimately take the lead. General Hospital is trying to redeem Franco, so there’s no need to tack on any extra acts of violence. Besides, Drew’s the tough Navy SEAL as well as Jim’s main victim. Is this all building to a final faceoff between Jim and Drew? It’ll be a letdown if GH doesn’t let them spar once more. Jim might grab Betsy and threaten her with a weapon. That could force Drew to take drastic action. If Jim doesn’t surrender and let Betsy go, Drew might have to kill his abuser. It’d be a fitting end to this dark and twisted saga. Do you think Jim’s fate will be gruesome? Will he pay the ultimate price for his horrible transgressions? We’ll give you updates as other GH news comes in. Stay tuned to the ABC soap and don’t forget to check CDL often for the latest General Hospital spoilers, updates and news.